ASK FOR SPECIAL RATE FOR SEPTEMBER AND OCTOBER!!! PLEASE READ THE DESCRIPTION CAREFULLY!! PLEASE CONTACT ME BEFORE SUBMITTING A RESERVATION REQUEST!!! ALSO THE PUBLISHED STANDARD RATE IS IN US $ AND FOR THE LOWEST SEASON , WHICH IS THE MONTH OF OCTOBER!!! : FOR A PARTY OF (2) AND WITHOUT FEES . THE STANDARD RATE SHOWN ONLY APPLIES IN OCTOBER!!!!!!!!!!!!!!!!!!!!! PLEASE DO NOT HESITATE TO ASK IF YOU HAVE QUESTIONS!! PLEASE ASK ABOUT LAST MINUTE SPECIALS!! Experience a magnificent sunrise over the ocean, seen from your bedroom window. Relax by the new infinite edge pool or enjoy the secluded, white sandy beach and the turquoise water of the Caribbean. The Resort is situated on a very private stretch of pristine beach, it is gated with a security guard on duty 7pm to 7am, very safe with plenty of worries free parking in case you rent a car. It has 3 connected towers with 8 units each (some units are combined by one owner). It is very quiet, relaxing and serene, very different than the general party atmosphere you find in Playa or Cancun! No beach vendors will bother you while working on your tan. This tranquil, private villa, situated right on the beach has gorgeous ocean views from Main Bedroom Ensuite and Living room. The units 2nd bedroom suite on Garden View side is furnished with a queen bed and Onyx tabled dresser. It has its own private bathroom and the suite can be locked for privacy by a locking door; ideal for two couples or for a family with kids. The main bedroom, with a king size bed has a sleeper couch and a seating area overlooking the pool and the beach with private accesses to the bathroom. The newly remodeled kitchen with granite counter tops has everything you desire for your vacation needs and offers a break fast bar for quick meals or a snack. The living room has a sectional couch, large flat screen TV, DVD player (with a selection of DVDs) and a Stereo with AUX input to play your favorite music. The 2nd Bedroom, the Kitchen, Living and Dining area feature vaulted ceilings for an enjoyable spacious feeling.A dining room which comfortable seats 6 invites you for these memorable sit down dinners to share good food and your favorite vacation stories. Each room has its own individual adjustable A/C unit for the utmost comfort. The generous shaded balcony invites you for your meals or a drink at the comfortable cushioned patio set. There is also a BBQ to grill the delicious fresh fish you'll get at the fish market!!! The beach right in front of our unit invites you to snorkel along the Great Mayan Barrier Reef which is the 2nd largest reef in the world with lobsters, turtles, groupers, barracuda, dolphin, sting rays and many colorful Caribbean sea life. Cenote cavern diving in crystalline fresh water is just a short drive away. All local dive shops offer scuba diving and snorkeling packages. Charters are available at the world class El Cid Marina just down the beach or you can go into town and book a trip with the locals and enjoy Bill fishing and light tackle fishing. For your security a safe is provided. There is one mid-week maid light service included, access to a concierge service and security personal from 7pm to 7am on the premise. Puerto Morelos is conveniently located 20 minutes from the Cancun International Airport, 30 minutes from the city of Cancun and 20 minutes from Playa del Carmen. Within walking distance - 10-15min- to town center you can find many authentic Mexican restaurants, a variety of other excellent cuisines, as well as a fresh food market, a daily fresh seafood market and a grocery store. Enjoy all the activities and sight seeing the Cancun area, the Mayan Riviera and the Great Mayan Reef have to offer. Please inquire with your specific dates. This resort is directly on the beach!! A Room With A (spectucular) View! Prior to arrival Karl was easy to contact and quick to respond to emails and answer questions. Upon arrival, the condo was all we hoped it would be and more. After using Canada Transfers from the airport (highly recommend), we arrived quite late at night and thankfully managed to get into the condo easily with the code Karl had supplied. The condo itself was spacious and clean and the views from both the balcony and master bedroom were nothing short of spectacular. 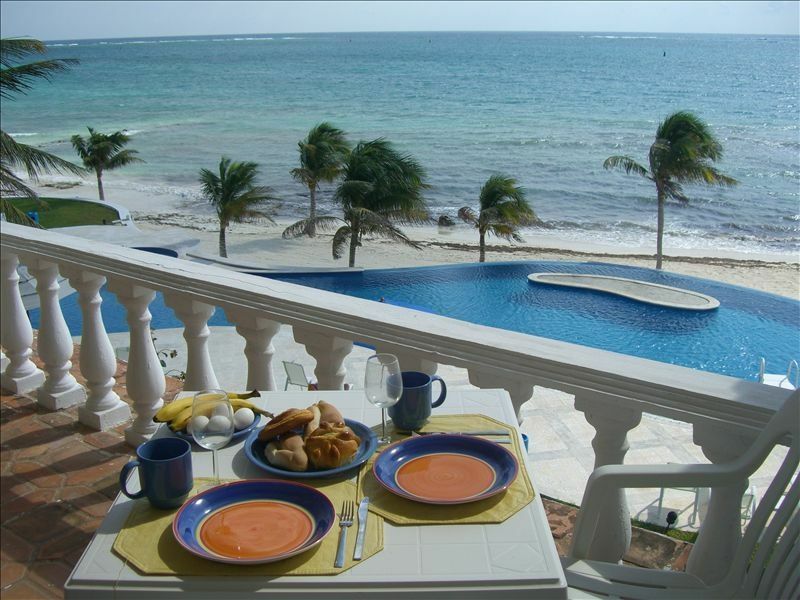 Our mornings were spent drinking coffee on the balcony while enjoying the warm breeze and beautiful Caribbean. Each day our little "visitor" (a sweet bird ) would greet us hoping for a crumb or 2. Inside the unit the furniture was comfortable with a spacious dining table for 6 as well as very comfortable balcony furniture which we took advantage of daily. The master bedroom has a very firm king sized bed which we both loved and there are various shelves and ample closet space to accommodate your clothing. As well, there was a futon sofa/mattress which was comfortable and could easily sleep another adult (or 2 children) . We did not make use of the 2nd bedroom but noted it also had a large bed, lots of dresser space and an ensuite bathroom. The kitchen had plenty of space in which to maneuver and was well stocked with all the necessities including a corkscrew for the wine 👍�😉�. The living room had a sofa, love seat, and a TV for viewing DVDs only. The wifi worked well and Arlene was readily available to answer any of our questions as was Fernando for any maintenance issues (we had none). The condo development is nicely kept with beautiful foliage and plants throughout the premises. The pool is ridiculously large (in a good way) with ample chairs and umbrellas. Caribbean Reef Villas is located a pleasant 15 minute walk to the town which we enjoyed doing daily. We felt safe the entire time and did not feel the need to take a taxi with the exception of the day we grocery shopped. The town of Puerto Morelos itself is charming with multiple amazing eating establishments and little booths with locals selling their goods. We loved the town, the people and the laid back vibe of Puerto Morelos and definitely hope to be back one day. Karl's unit is perfectly situated for a peaceful, relaxing vacation. The pictures on the website are an accurate depiction of the unit and the property. If you are looking for a relaxing getaway to a beautiful part of Mexico, I would highly recommend Karl's unit. Thank you so much for your kind words and the time you took to write a review. I am happy that I could help you to have a memorable vacation and I am looking forward to have you back soon!!! Thank you. This is a great apartment with wonderful views. My group enjoyed their stay. We had quite a issue with the ceiling leaking in the bathroom so had to keep towels on the floor to soak it up. Arlene was always available and she tried her best to help. Sounds like the ceiling will be repaired soon so it is probably not going to affect anyone else. The pool area is wonderful and we loved walking into town. Aw .....thank you for your kind words and the trouble of leaving a review. I am happy you enjoyed your vacation! If only I had know earlier about the ceiling, it wouldn't have bee an issue at all. Also I am happy to report that the issue is resolved and I am looking forward to host you again soon. Thank you very much. Our family thoroughly enjoyed our stay in Karl's unit and everything was as described in the listing. It is a convenient walk into Puerto Morelos, which has numerous shops and restaurants (we didn't have a bad meal our entire stay) and is much more laid back than the hustle and bustle of Cancun. We often had the pool to ourselves and snorkeled right off the beach a number of times observing a multitude of tropical fish, rays, starfish and conch shells. Additionally, the location of the condo is a convenient launch point for day trips to the Mayan ruins, cenotes and other attractions in the area. All around, a great experience. Our stay in Puerto Morelos was wonderful, and the condo was perfect. It was clean, comfortable and well accommodated. Arlene was always close by and helpful with any questions. The entire staff at Caribbean Reef was always helpful. The owner, Karl, replied to our emails very timely and ensured we were well taken care of. Every restaurant we ate at in town was incredible, I could not pick a favorite. We went diving and snorkeling with Diverspoint who I would highly recommend. thank you so very much for your kind words and thank you for trusting me with you precious vacation. I am so glad you had a good time and I am looking forward to have you back soon. Thank you so much for your trouble of leaving a review. i am glad you had a good time and enjoyed your stay. I am looking forward to have you again soon! Karl's condo and the entire complex is beautiful. The infinity pool was cool, refreshing and quiet most days and new beach loungers were lovely and comfortable to relax by the pool or the ocean. The beach is maintained from seaweed the best a man, a rake and wheelbarrows can do. The views from the well appointed balcony are stunning. The condo comes perfectly furnished as described in the listing. The mattresses in the bedrooms were nice and firm which was excellent for our taste. Air conditioning worked perfectly and the condo gets lovely breezes from the ocean. The walk to town is perfect for meals and a taxi can be easy acquired for about $50 peso. You can walk miles along the beach to the Marina and likely past that if you wish. The wifi in the condo worked perfectly for streaming netflix for 7 of the 9 days of our vacation. The other 2 days there was no wifi available. Just preplan for these types of events for contact purposes home. Arlene and the crew at Caribbean Reef Villas were easy to contact by email or on site for any items or assistance needed. Karl was a breeze to communicate with and being a first time booker, I appreciated the quick and efficient information. Some must do tips while staying at the condo: We booked our transfers from the airport to the condo with Canada Transfers and found it simple and efficient with a pre-planned stop at the super chedraui. We also booked Chef Marco and Dona Sonia to cook for us in the condo the first night of our stay which set the tone for a relaxing vacation. Book Karl's condo now.